Yoshihiro Tatsumi has a reputation for providing bleak and deep comics that delve into the worst aspects of human behavior. I’m not going to try and refute that reputation, but I would add that his stories in collections like The Push Man and Other Stories (Drawn & Quarterly) are eminently readable in addition to being grim. His content may be dark, but his presentation is… well… snappy. I know that’s a weird adjective to use about stories where fetuses routinely float through sewers, but it’s true. If you’ve been curious to see the work of one of the founders of Japanese comics for grown-ups but have found characterizations of that work off-putting (and I can totally sympathize, as I held off on reading his work for a while), Drawn & Quarterly has an alternative for you: Black Blizzard. It’s one of Tatsumi’s early works created for the then-booming rental-manga market, a period discussed in fascinating detail in the creator’s autobiography, A Drifting Life (Drawn & Quarterly). It’s a straightforward genre thriller about two prisoners who go on the run while cuffed together. One is a young pianist accused of killing the abusive father of his young muse. The other is a career criminal who’s had enough of life behind bars. As they flee pursuing police officers in the titular snowstorm, the escapees bond in a way. They also ponder ways to get rid of those pesky cuffs. There aren’t many deep undercurrents, just fast-paced drama mixed with effective flashbacks of the pianist’s various misfortunes. It’s designed to entertain, and it succeeds. The best way I can describe it is to liken it to one of those one-hour drama anthologies from 1950s television. It could feature an introduction from a dapperly attired Fred MacMurray and be brought to us by the good people at Pontiac. It’s solidly crafted suspense, perhaps not conceived to be ageless, but it holds up well. 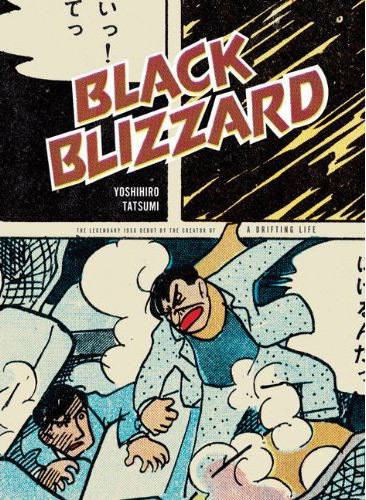 Even if you aren’t interested in Tatsumi’s early work, Black Blizzard is a fine example of diversion of a certain vintage. This entry was posted on Thursday, April 1st, 2010 at 6:32 pm and is filed under Drawn & Quarterly, From the stack. You can follow any responses to this entry through the RSS 2.0 feed. Both comments and pings are currently closed.